Respondent :- State Of U.P. Thru. Secy. Woman & Child Development & Ors. Heard Mr.Ramesh Pandey, learned counsel for the petitioner as well as Mr.Amrendra Kumar Bajpai, learned counsel for the respondents. The petitioner has assailed the transfer order dated 21 November 2016 issued by the Special Secretary, Department of Women and Child Development of the State Government, whereby the petitioner while posted at Bal Vikas Pariyojna Adhikari at Balrampur has been transferred to Bulandshahar. The learned counsel for the petitioner has submitted that the petitioner's transfer is purely based on political dictate.� In support of his submission he has brought on record one letter dated 7 September 2016, written by the Hon'ble State Minister of Jantu Udyan Evam Chikitsa Swasthya, Prabhari Manti Lucknow/Ballia, even he is not concerned Minister of the Department, but he has recommended the petitioner's transfer being his activities against the political party. The Hon'ble Minister belongs to Samajwadi Party and he has observed petitioner's activities being against the policies of Samajwadi Party, therefore, he had recommended so. The other documents have been brought on record including one letter dated 16 November 2016 issued by the Director of the Department which has referred to the name of the complainant, in which the name of Dr.Shiv Pratap Yadav, Minister Jantu Udyan Evam Chikitsa Swasthya has been indicated, which establishes the connectivity of the petitioner's transfer with his dictate. Therefore, obviously the facts stated above establish that the petitioner's transfer is based on political consideration. Hence it definitely requires interference by this court. "the petitioner was appointed in the year 1999 and has undergone 17 years of service on the post of Child Development Project Officer. In this tenure of service, he has spent 16 years in Devi Patan Division itself and within the said Division, 7 years of posting in district Balrampur......."
Thus, it has been stated that the petitioner has enjoyed his service for seven years at Balrampur, whereas the transfer policy permits the posting of an employee for maximum 6 years in a district and ten years in a Division. Therefore, the political recommendation may not be the basis of transfer. Regard being had to the aforesaid submissions, we are of the view that certainly the order of transfer impugned being based on political dictate requires interference by this court. Therefore, we hereby quash it. Simultaneously by noticing the facts narrated in the counter affidavit, as above, we issue direction to the respondents to post the petitioner at somewhere else forthwith, which may be issued simultaneously even alongwith the order cancelling his transfer order dated 21 November 2016, pursuant to this order. 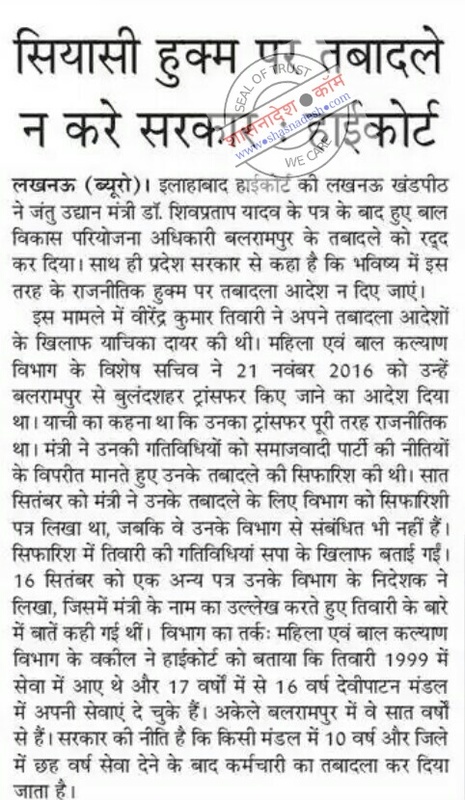 Any how the petitioner shall not be allowed to continue at Balrampur further. At the same time we would be failing in our duty if we do not take note of the recommendation of the Hon'ble State Minister to transfer the petitioner over which the State has acted upon without making any further inquiry of the allegations levelled against the petitioner. Therefore, we hereby advise the Government for future not to repeat such an order based on political dictate without making any further inquiry in the matter and having been found any material therefor. With the aforesaid observations and directions the writ petition stands disposed of finally.